I’ve always wanted to build the Messerschmitt Bf-109V-14 of Ernst Udet from the 1937 Dubendorf Air Races. How about you? Do you need a wine red Bf-109 to offset the 74/75/76 machines? Ever wanted to try your hand at an air racer just to make the civilian guys mad at a contest? LOL Well now is the time. Werner’s Wings is proud to announce our first non-helicopter conversion set, the LIMITED EDITION Messerschmitt Bf-109V-13/V-14 Multi-media conversion set. You will be able to build one of three versions from this set. You will be able to build the V-13 as either the air racer or the record setter and the V-14, my personal favorite, as the machine flown and crashed by Udet. Designed for the 1/48th scale Tamiya Bf-109E-3 kit, the set will include a new resin nose, oil cooler, gun blanking covers, landing gear doors, and two types of spinners. Also included will be a new record setting canopy for the V-13. 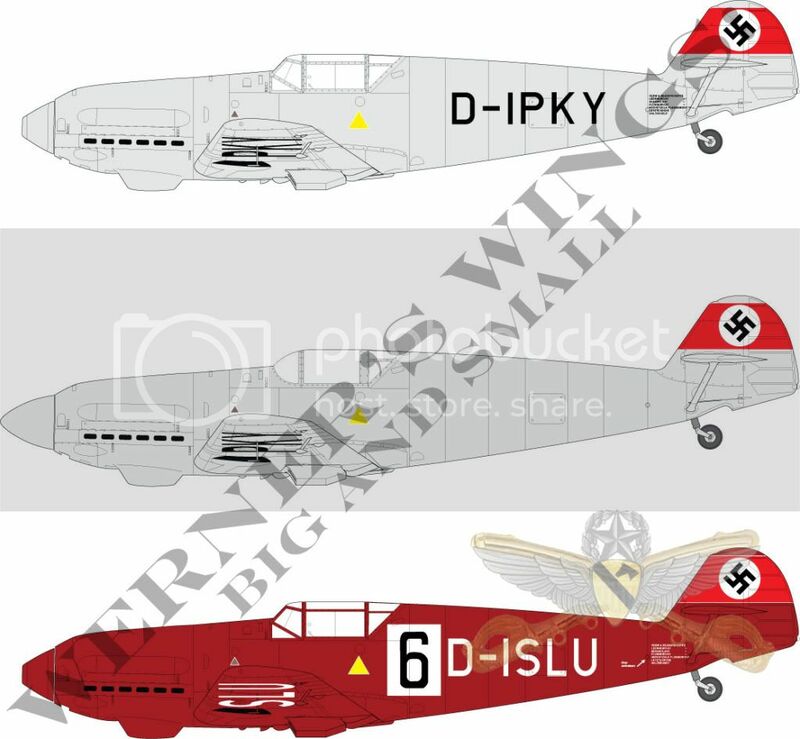 There will be a sheet of decals for the V-13 and the V-14. Like the A-Team I’ve assembled some of the best in the business. The first person to make this possible is Jean-Luc Formery. You may have seen his beautiful conversion set of the V-13/V-14 on Aeroscale or Armorama. Check out the article here (http://www.aeroscale.co.uk/modules.p...icle&artid=938 ). Without Jean-Luc’s generous help and expertise this set would not have been possible, but wait there is more. Thanks to Joseph Osborn of Fireball Modelworks (http://www.fireballmodels.info/) we will provide the additional record setting spinner not seen in the original release. Then there is Falcon Canopy (http://www.falconmodels.co.nz/) who mastered the record setting canopy for the V-13 record setter. Still not enough? How about decals designed by Keith Davidson from Red Pegasus Decals? (http://www.redpegasusdecals.com/) Keith is well known for his excellent air racing decals and now he has designed these for me. What you want more? The decals are being printed by Cartograf so you know they will be the best in the world. Still more? Tom Tullis (http://www.tullisart.com/) is doing the artwork for the instructions. Now this won’t be the gorgeous airbrushed ones that Tom is known for but beautiful drawings none the less. OK it all sounds nice and good, but there has to be a downside. There are actually two. The first is that if you are building the air racers, I recommend that you buy the Squadron Bf-109E-3 canopy because you won’t have to fill the antenna mast hole on the kit part. Other than that the only downside is that as currently planned, this set is a LIMITED EDITION OF 250 EXAMPLES. So how do you get yours? These sets will be released at the Nationals in Columbus. The cost per set will be $25 USD at the show. I will be with the Master Class Model Building Video table co-stationed with Nostalgic Plastic. After the show, whatever I have left will be sold through my website at www.wernerswings.com on a first come, first serve basis. The cost will be $25 plus shipping. Deals given if you buy more things. So if you’ve wanted these versions of the Bf-109 now is the time. Remember one set will build ONLY one version of three choices. If you want to build all three versions you will need three sets. You can never have too many 109s. Here is the artwork for the newest release by Werner's Wings. I think that the new nose and canopy make the record setting V-13 a very sleek looking machine. This is a LIMITED EDITION of 250. It contains resin conversion pieces, vacuformed canopy, and decals for one aircraft. If you want to do all three you will need three sets. It will be released at the IPMS/USA National Convention in August. The cost of the set in the US is $25, plus shipping. Outside the US, you will have to contact me for the information. I am taking pre-paid preorders, BUT only the first 50 in the US and 50 from Overseas for those that can't make the Nationals. When these 50 sets, respectively, are gone you will have to wait until after the IPMS/USA Nationals to get one, if there are any left. Ok how come I am always late to the party? Floyd do you have any of these sets still hanging around? I did not even see these released last year. I don't but check with Red Pegasus Decals. They may have some left. That is an old post . I actually got a set from you along with some of your Cobra sets. I was going to write and let you know I got the package this week. Looks great. I also read your article in a recent modelling mag (sorry I forget which one) and it was very helpful. Still a little confused with the lumps and bumps but I think the article you mentioned on HS will help shed some light.